Ack! Where has the time gone? It’s already January 13th and we still haven’t finished our holiday thank yous (and Hanukkah was so early, it’s even worse)! Oh well, I figure as long as they get ’em before Valentine’s Day, we’re in good shape and better late than never, right? I was taught from a young age the importance of writing a nice note of thanks for a gift and I am trying to install the same in my son, Avi, even at age 3 1/2. One thing that I think helps make the process a bit more fun is to make the cards yourselves. If you recall, we had a lot of fun doing the dreidel spin art from our Hanukkah Kiwi Crate back in December. I saved all of those little paintings thinking they’d come in handy for something like thank you notes and sure enough they did. The process was simple and kid-friendly. Starting with some nice colored A2 notecards from Memory Box (I get all mine at Impress in Seattle), Avi and I used a glue stick to glue down the paintings. After gluing them we put them under a stack of books to help them lay flat. Meanwhile we stamped “thank you” on some scrap white cardstock in turquoise and trimmed it up into cute little squares -I realized just how great my mini guillotine paper cutter is for little hands (with adult help of course!) Then we attached these using my favorite adhesive and finished off the look with some scattered star sequins glued on. And to explain the art like any good artist’s print, I put a little handwritten “Dreidel Spin Art by Avi” under each of the paintings. Absolutely perfect kid thank yous! As Hanukkah 2012 draws to a close, I want to share one final Hanukkah project with you. As you are probably painfully aware, finding a Christmas T-shirt or pajamas (or anything) for kids is so easy but Hanukkah-wise, you’ll be lucky to find anything. Last year, I lucked out and found a “Dreidel Champion” T-shirt by Carter’s. This year, armed with my trusty Silhouette, I decided to make my own using simple Ts from Old Navy and a variety of vinyl. I had bought some purple foil star of david ribbon on one of my 1-800-Dreidel shopping trips and couldn’t resist the chance to use it for a matching bow. A little hot glue and a pony tail holder and I was in business. Finally, for my own mini-mensch, I’d planned to do a collage of numbers since counting is rather popular in our house at the moment but he informed me that he wanted a menorah so a menorah he got. Using gold glitter vinyl and several shades of blue in plain and flocked, I created this “8 Crazy Nights” shirt. He absolutely loved it (he wore it more than once!). I just can’t resist the chance to show off his Hanukkah (and all around) cuteness. Hope your Hanukkah was as full of sheer joy as mine! As Hanukkah reminds us of the miracle of light, there are so many positive ways that we can channel our collective feelings of sorrow surrounding the Newtown tragedy. My heart aches for the families and I wanted to share one outlet that speaks to my creative side. One of my favorite crafty blogs, Damask Love has created a very special project to inspire healing through creativity. Check it out if you are looking for a non-traditional way to help. Happy 4th Night of Hanukkah! It seems like there has been a lot of discussion online lately on Hanukkah trying to compete with Christmas so let me just say, no, Hanukkah is NOT the Jewish Christmas. But, it does fall during the darkest time of year when everyone is just looking to add a little light and cheer to their life. So, why not get into the decorating spirit a bit? Last year as I looked through the latest Pottery Barn catalog, bummed by the limited Hanukkah offerings, I noticed these cute word stocking holders spelling out “JOY” and couldn’t help but think how festive they looked. I wondered if there a Jewish word that would look equally cute and cheerful on my mantel to add a little fun to my menorah display? And then it came to me: “SHALOM.” Of course I had a vision for what it would look like and since that wasn’t available pre-fab, I would have to DIY. I managed to find some nice white wood letters at Joann or Michael’s that stood nicely on their own. First, I removed all the labels – the ones I bought last year were a major pain and I had to use nail polish remover for the labels and pliers for the hang tags but the ones I got this year were much improved and the labels and tags came right off. I tried to just go straight to the glitter paint but quickly found that coverage wasn’t the solid look I was going for. So, next, I gave them a good coat of silver spray paint on all sides. Once the spray paint was dry, I used a foam brush to apply 2-3 coats of Martha Stewart Antique Silver Acrylic Paint to get a nice glittery coating. Here’s a picture of it on my mantel last Hanukkah (note the decorative glass dreidels scattered about too). This year the letters are a bit more spread out in a slightly different arrangement. Now if only I could finish a set for my best friend before Hanukkah is over! But, even if I don’t, the beauty of the word “Shalom” though is that really you could use it for many (any?) Jewish holidays (I think it’d be especially nice for Passover) or even all year round. Since the letters are all separate, you can maneuver them to fit your other decor however you want! Want to make a set for yourself? Or maybe you’ve been inspired to make something else? Well, as a little Hanukkah treat, I’m giving away a Michael’s gift card ($18 of course!). Just leave a comment here and tell me what crafty supplies you’d use it for by Sunday, December 16th at 6pm PST. 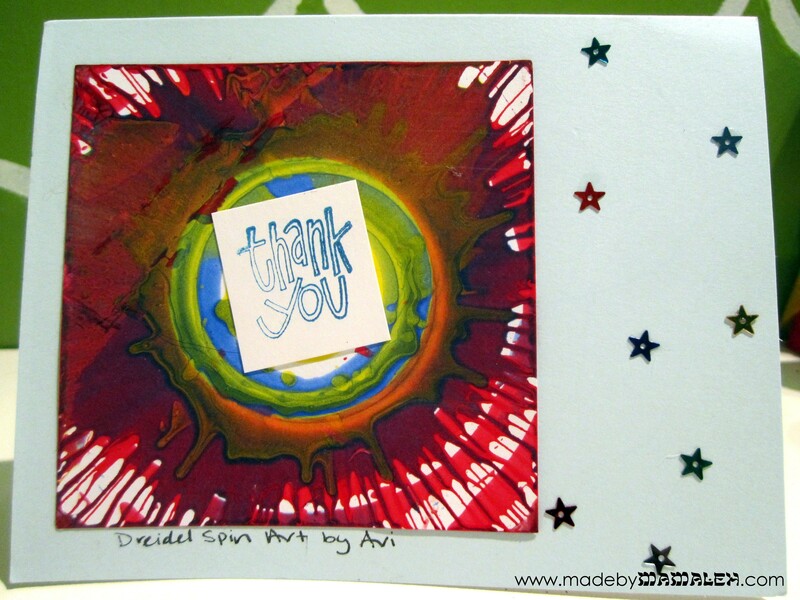 Extra entries for 1) liking Made by Mamaleh on Facebook and/or 2) following the blog via email. Just leave an additional comment for each one. If you are already a follower then you automatically get extra entries (just be sure to leave comments for each). This giveaway is open to US residents only – sorry to my friends abroad! Hanukkah crafting from Kiwi Crate! Ima Design winner! I have to admit – I’m generally not one to purchase pre-fab crafting kits; I have hoards of craft supplies so if I want to make something, I generally only need to get a couple items. But when Kiwi Crate contacted me and asked if I’d like to try out their Handmade Hanukkah kit, I figured why not. I’m always open to try something new. Kiwi Crate is a children’s creativity company, targeted for kids ages 3-7. They offer monthly subscription activity boxes as well as special projects like the Hanukkah box. Each crate is filled with enriching & engaging kid-tested projects which cover a range of developmental areas and subjects, including art, science, and imaginative play. The box arrived nicely wrapped in brown packing paper with a big Kiwi Crate logo and addressed directly to my son (which was a big hit of course). This was a nice touch in the age of elaborate, difficult to open packaging; no box cutters were needed, so my son could open it himself. When my son managed to rip the paper off, we found the darling little Kiwi Crate Box filled directions and the makings for two Hanukkah projects: a tissue paper covered menorah (battery operated) and dreidel spin art. Speaking of the directions, they are fantastic! Being a crafty mamaleh, I probably could have gotten by without them. But for those less craftily inclined, the details and pictures make the projects easy. I imagine that they’d be great for kids of reading-age too. We decided to start with the menorah. The materials included candle holder, tissue paper, glittery Mod Podge with tray, foam brush, shamash holder, foam for the shamash, and LED flicker candles. The process itself was simple albeit a little messy. It was my first time using glitter Mod Podge and I found myself daydreaming about what grown-up projects I might be able to use it for as it was just pure sparkly goodness. I will say though that my three-year old’s attention span waned after about 2 candle holders so I was left to finish the rest on my own. I do think that makes for a project which could easily be shared by multiple kids – I sort of wished we’d invited friends to do it with us. It wasn’t until the menorah was all dry, that my son regained interest when it came time to “light” the “candles.” I must say, it’s pretty cute and fun and will be a nice, non-fire hazard menorah to use for the holiday. Next up was the dreidel spin art and I gotta say this was super fun for both of us! But oy, was it messy! Be sure to put on smocks and do it on a drop cloth of some sort (we used a coated tablecloth on the floor). 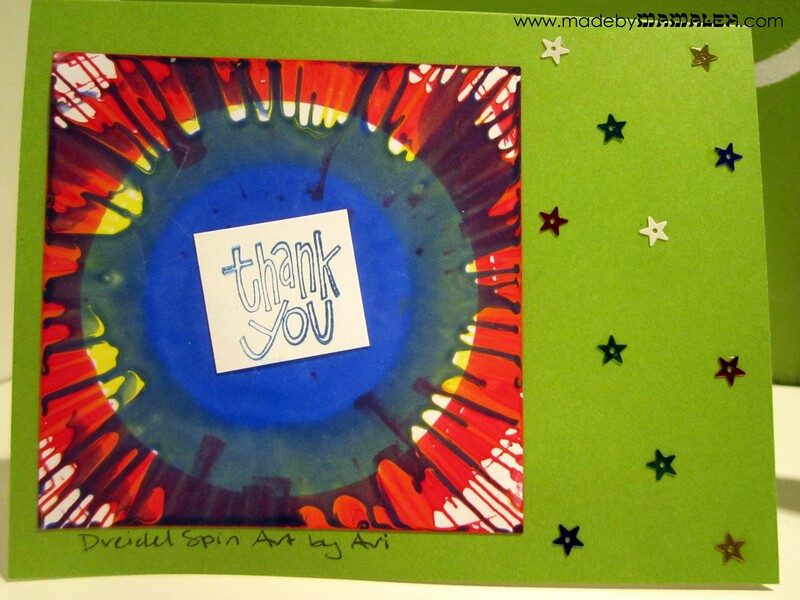 You use the included plain wood dreidel and pre-cut pieces of paper to do spin art in the Kiwi Crate box. I loved how many pieces of paper were included – ample enough for 2 or 3 kids to do a bunch. And when you’re done, there are Hebrew letter stickers included for the dreidel to restore its traditional Hanukkah role. My only wish was that the box had been a bit taller since the paint splatter definitely went over the sides (to its credit, it did wash off pretty easily). The resulting art is really fun and unique. Perhaps we’ll use them to create Hanukkah gift thank you notes by putting them on a notecard and adding some stamped cardstock on top to cover the hole. Overall, I was pleasantly surprised with the Kiwi Crate. As an avid crafter who generally likes to do my own thing, it was sort of nice to be given direction. Along those same lines, it was nice to not have to worry about my son destroying my own supplies to do his project. Everything we needed was included in the box which I think is excellent way to help people who feel intimidated when they go to a store like Michael’s or Joann. Even I get overwhelmed at those stores with the variety of supplies and tools available. I think Kiwi Crates are creative and fun gift ideas; I may have to order a few for friends. Oh and I almost forgot, the winner of the Ima Design contest is #1, Jamie. Look for an email with details! Note: I was not financially compensated for this post. I received a Hanukkah Kiwi Crate free for review purposes. The opinions are completely my own based on my and my son’s experience. They are both adorable calendars and my son loves them. BUT they only count the actual days of Hanukkah, not the excitement and anticipation of the days leading up to it. So I decided it was time to make my own calendar and to give it a true Jewish slant. I thought we’d count down the 18 (chai) days before Hanukkah as well as the days of Hanukkah themselves. Using Microsoft Publisher and some great graphics I purchased from Maree Truelove on etsy, I created a printable Chai to Hanukkah Countdown Calendar for 2012 to share with all of you! Speaking of the graphics, Maree Truelove has some really cute Hanukkah graphics if you need some for a project – it’s so hard to find non-cheesy Hanukkah graphics and hers fit the bill. I printed mine on good quality white cardstock and then printed the stickers, below, on a sheet of sticker paper and cut them out using the paper cutter (scissors would work fine too – I gave you gridlines to make it easy!). 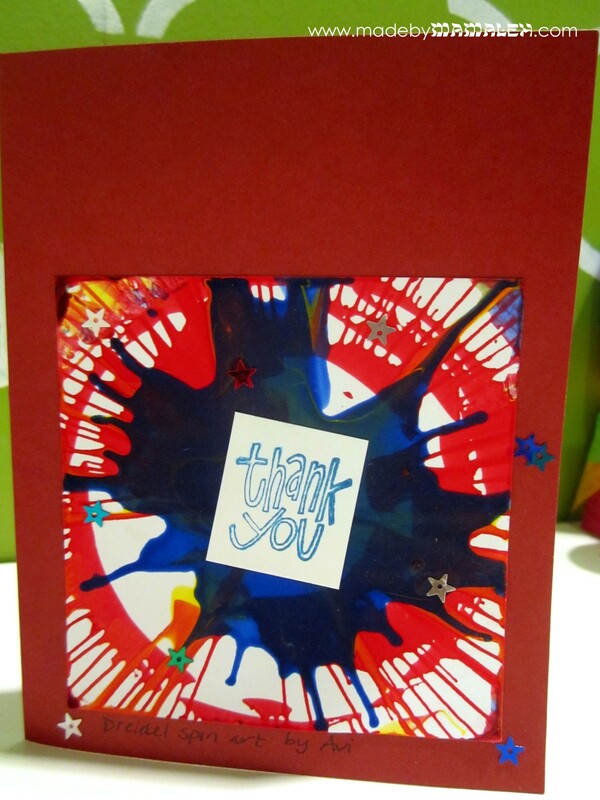 But you could also print on paper and use tape, a glue stick or even print on magnet paper. My intention was that you start with the “Chai to Hanukkah” sticker and then use the numbered stickers for each of the 8 nights, but really you can do whatever you (or your kids) feel like. Hope you are as excited to countdown to Hanukkah as we are in my house! 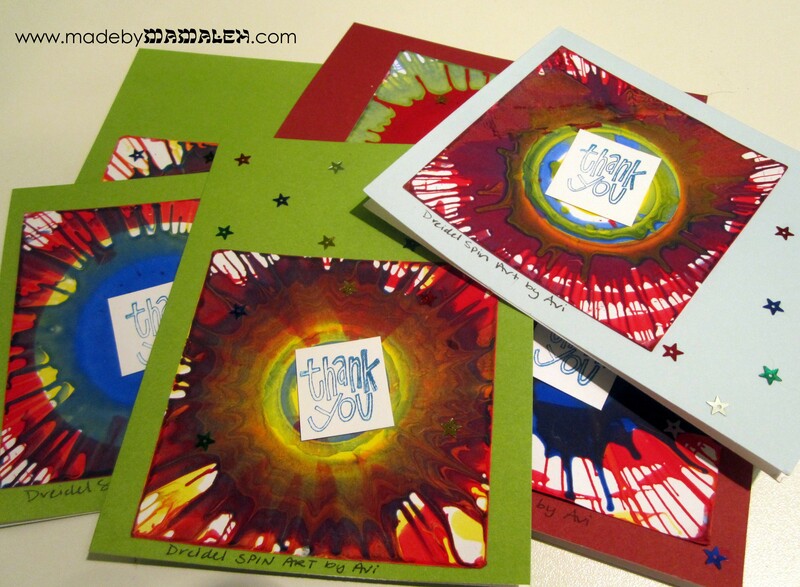 Hanukkah is Coming: Cards and a Giveaway! Hanukkah starts at sundown on Saturday, December 8th so less than a month to go and I’m just gearing up. 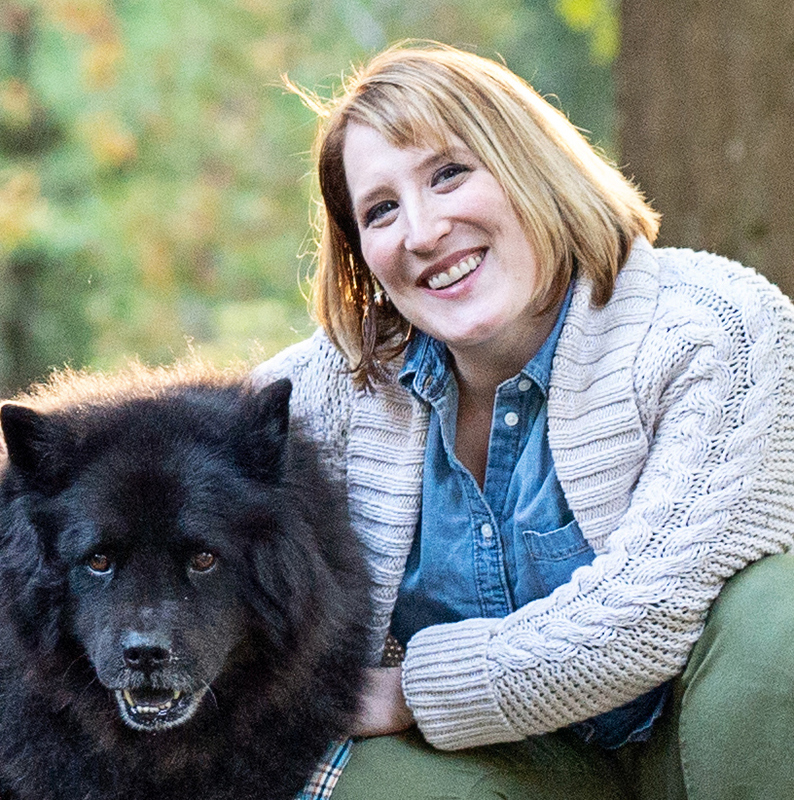 We just picked out our pics from our recent family photo session with the fabulous Jennifer Tai. Now the next step is to pick a card. And yes, I order my cards since my holiday card list is just too long to think about making them myself. 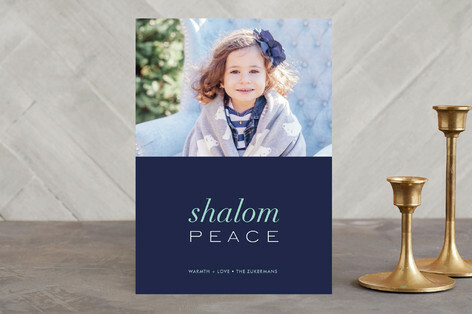 Still need to take a good Hanukkah picture to show off your little cutie? How about a Hanukkah onesie from IMA Design? One lucky reader will win a “Nes Gadol Haya Po” onesie, (translation: A Great Miracle Happened Here) from IMA Design in your choice of size: newborn, 3 months, 6 months, or 12 months so you can make the cutest Hanukkah card ever! To win, simply leave a comment on this post telling me what you are doing to get ready for Hanukkah. Want additional entries? One additional entry for each of the following: 1) Like Made by Mamaleh on Facebook; 2) Share this post on Facebook; 3) Subscribe to Made by Mamaleh via email. Just be sure to leave a separate comment for each one so you get each entry you deserve! Entries must be posted by 11pm PST on Sunday, November 18th. If you want to buy your own or maybe think ahead to Pesach with a Baby’s First Passover Organic onesie or even thinking about next Rosh Hashanah with a Sweet Like Honey Hebrew onesie, IMA Design is offering Made by Mamaleh readers a special 20% discount for order placed on their site until December 31st. Just enter coupon code: Mamaleh. 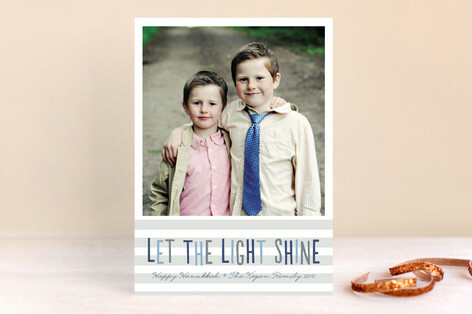 Tiny Prints does cards well whether it be holiday cards, baby announcements, birthday invites, you name it. Their Hanukkah card collection is no different. I love that this year they have some really cute cards for families that celebrate both Christmas and Hanukkah. Minted is on the spendier side but their products are gorgeous with modern sophisticated styles. This year’s selection of Hanukkah cards is simply lovely. 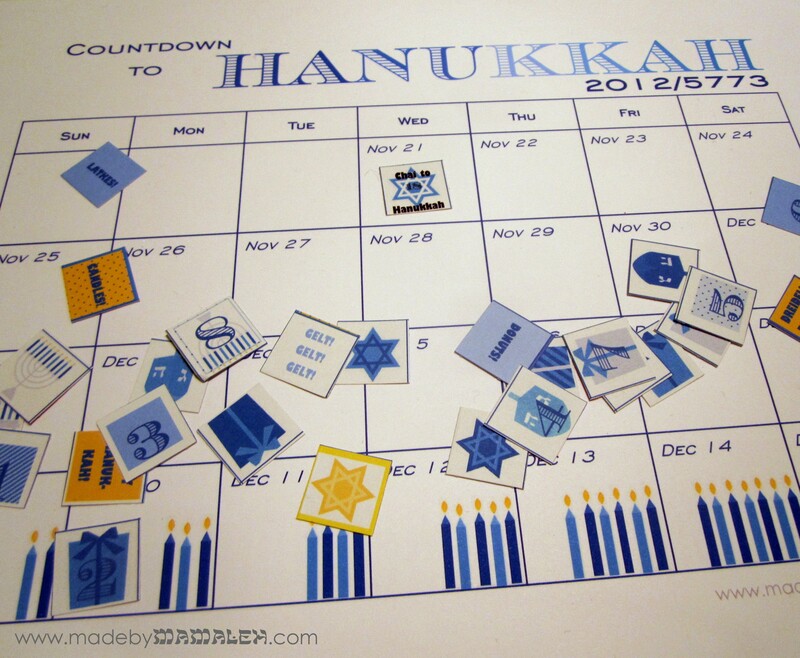 Snapfish has a nice selection of reasonably priced Hanukkah cards with a variety of layouts. What about you? Are you sending cards this year? Are they Hanukkah specific? Don’t forget to enter to win the Hanukkah onesie from IMA Design! And stay tuned for lots of fun Hanukkah happenings – gift ideas, giveaways, product reviews and of course, projects made by Mamaleh! Note: many of the cards featured here are no longer available and links have been removed. Sorry.